This project was supported by Grant No. 2010-WA-AX-0010 awarded by the Office on Violence Against Women, U.S. Department of Justice. The opinions, findings, conclusions and recommendations expressed in this publication/program are those of the author(s) and do not necessarily reflect the views of the Department of Justice, Office on Violence Against Women. This entry was posted in Midd Blogosphere and tagged For Faculty, For Staff, Middlebury on March 11, 2015 by Emily Pedowitz. The Sister-to-Sister Annual Summit is Approaching! Calling all middle school girls! Bring a friend and come join Sister-to-Sister’s most popular event—the annual summit! The summit will be held on Saturday, November 22 at the Mahaney Center for the Arts at Middlebury College. The summit is a full day of events beginning at 9:30 am and continuing until 4:30 pm. 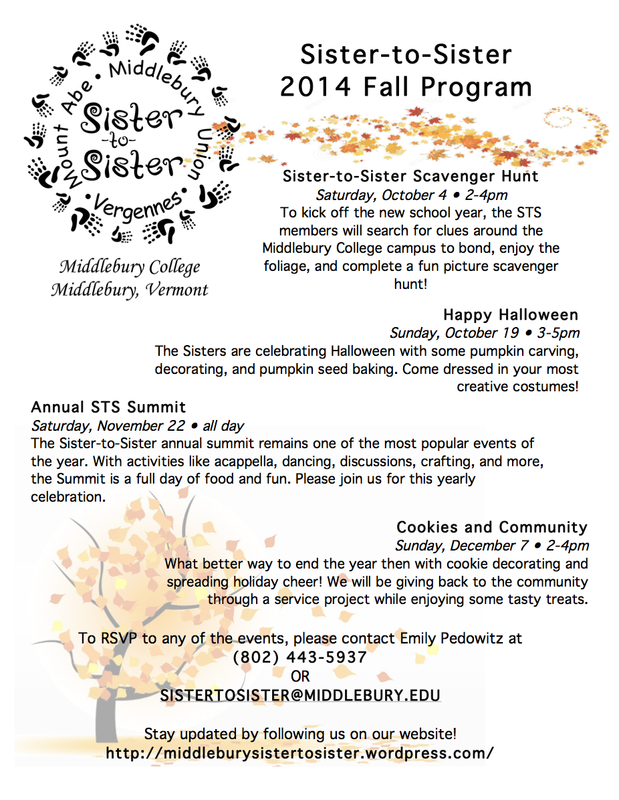 Sister-to-Sister, an organization run by Middlebury college students and the American Association of University Women brings together middle school girls from Bristol, Middlebury and Vergennes with Middlebury College student mentors. With the help of “campus supervisors,” mentors develop experiences that encourage girls to try new things outside of the classroom including such activities as art, music, dance, sign language, and yoga. Sister-to-Sister also focuses on discussions of such topics as body image, women in history, relationships, popularity, self-defense, identity and the internet, and self confidence. So far, this semester we have had an impromptu game day and a Halloween event, in which we carved pumpkins, took pictures for our scavenger hunt, and competed in some cider donut races. We look forward to continuing the fun and games at the summit. This entry was posted in Midd Blogosphere and tagged For Faculty, For Staff on November 12, 2014 by Emily Pedowitz. Stay updated by following us on our website! 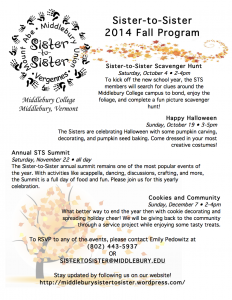 This entry was posted in Midd Blogosphere and tagged For Faculty, For Staff, MiddPoints on November 3, 2014 by Emily Pedowitz. This entry was posted in Midd Blogosphere and tagged For Faculty, For Staff on September 23, 2014 by Emily Pedowitz.